Took my Nexstar 8SE out around midnight (it was hazy earlier). I concentrated on the constellation Auriga to the Northeast but over the course of the evening, had a look at the Pleides, the Hyades, Castor and Pollux and then finally Jupiter with initially 3 then 4 moons. A 10 second exposure of Vega and surrounding stars. 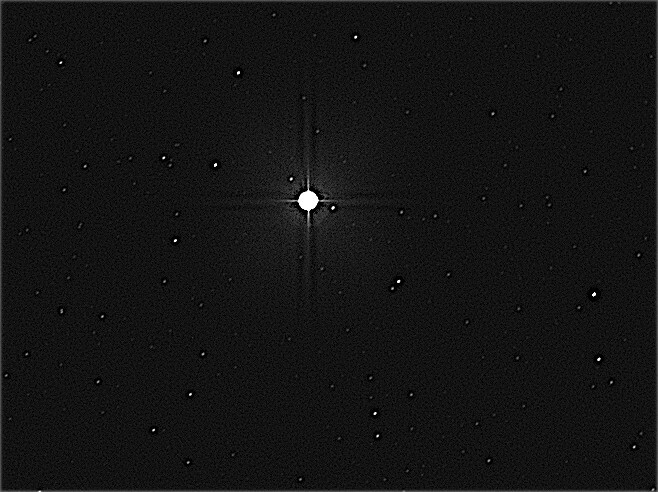 Its probably not too sensible to try to image one of the brightest stars in the sky but I thought if I couldn’t image Vega (Magnitude 0) with my ATIK CCD camera, then there wasn’t much hope. 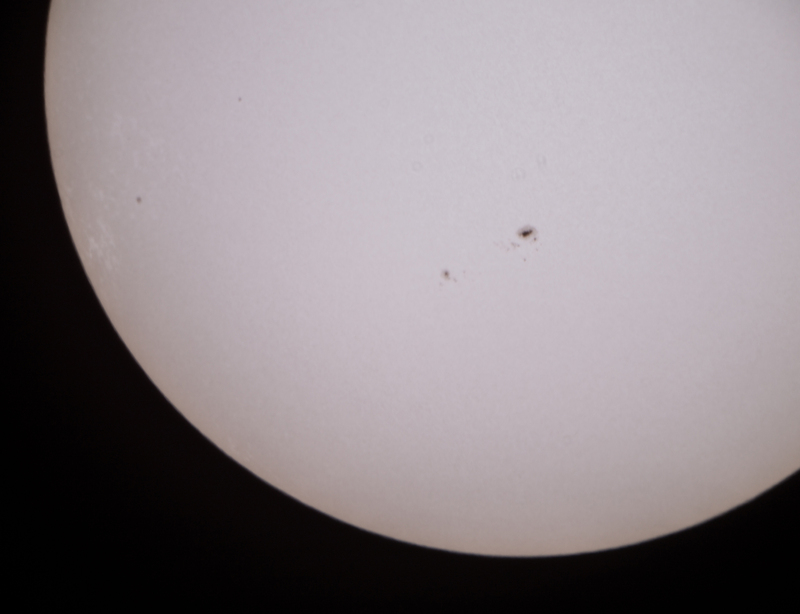 The image was processed in Registax 6. (I didn’t know this at the time but the first ever photographic image of a star was a Daguerreotype of Vega taken in 1850 – some 163 years before my first effort). Overall, an encouraging start with my new portable scope. Pin-sharp and contrasty images. The Ioptron Mini Tower 2 Go-To mount is easy to assemble and has excellent tracking. Observed some open clusters and my first ever view of Herschel’s planet Uranus – a green-blue dot. 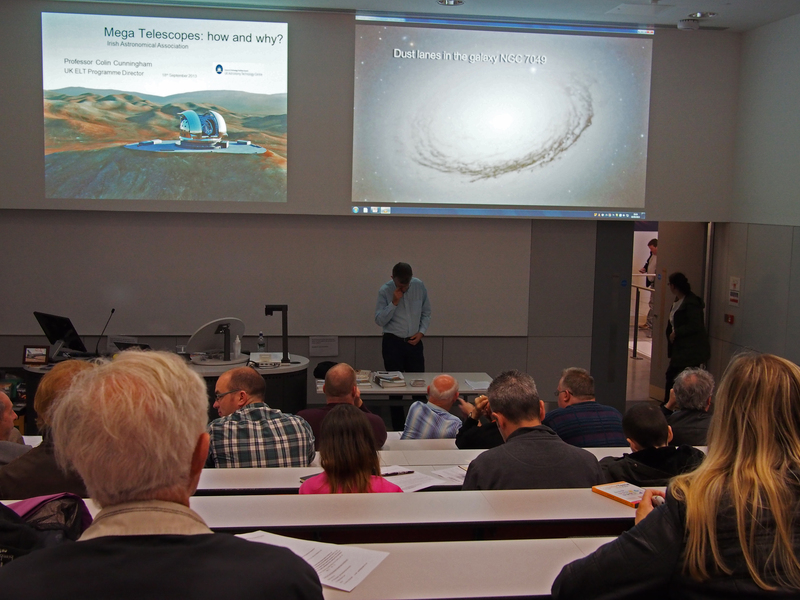 IAA September 18th Mega-Telescopes – How and Why? People coming in at the start of the Session. Jocelyn Bell Lecture Theatre QUB. I took these a little while ago but forgot to post them. 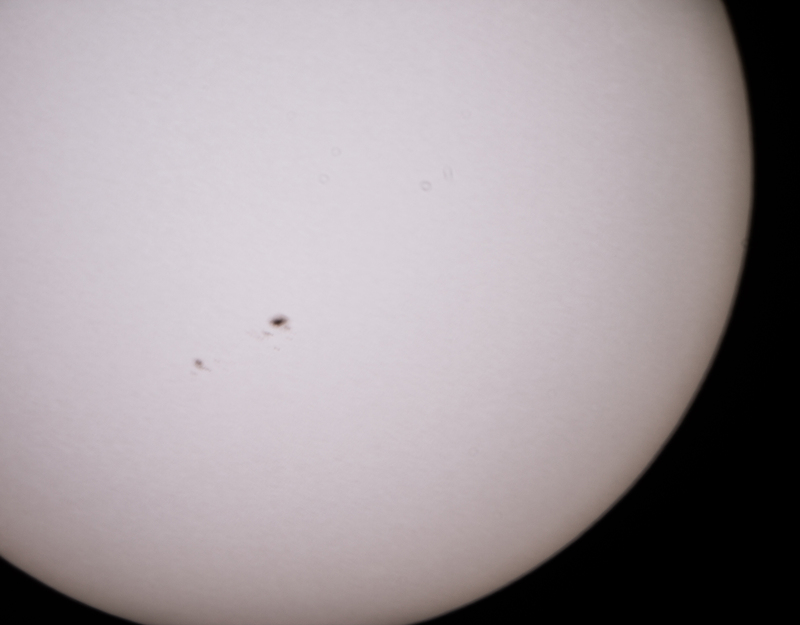 Just one sunspot pair visible that day. Focusing was very difficult – difficult to judge a small dark spot against a bright background. I’m still learning my way around the sky- a “go-to” scope sometimes makes it too easy. Tonight looked promising, so started with binoculars. Having located the “W” of Cassiopeia, I drew a line down from the right-hand “V” to the star, Mirach in Andromeda. About a quarter of the way up and slightly to the right of that line was the fuzzy lenticular glow of the Andromeda galaxy. Encouraged by my success, I dashed into the house to get my scope, tripod and power pack – by the time it was all set up it was cloudy again! Still, I was keen to try out a Vixen VLW 22mm versus a Baader Hyperion 24mm eyepiece (both in 2″ mode). So I played chase the star between the clouds. On paper, the Vixen should be better, but I have found the Vixen slightly awkward to use until tonight when I rolled down the rubber eyecup and ditched my glasses- after that it was just as comfortable as the Baader for my eyes. Things looked slightly brighter through the Vixen (better light transmission) – I thought there was a little more chromatic aberration with the Vixen -until I ditched my glasses again when the aberration disappeared. The field of view looked much the same in both. Overall, I thought the Vixen was slightly sharper and brighter than the Hyperion and I have finally found a comfortable position to use it. No new objects tonight but I can find my way to Andromeda! At last, the cloud has gone! (For a while). After a long hiatus, I got my scope out and aligned on Mirach and Aquila.